Jon Zawislak, an extension entomologist and doctoral student, is a resource for beekeepers around the state. FAYETTEVILLE, Ark. – Jon Zawislak, an extension entomologist and apiary expert for the University of Arkansas Cooperative Extension Service and doctoral student in Dale Bumpers College of Agricultural, Food and Life Sciences, was recently awarded with the Roger A. Morse Award by the Eastern Apicultural Society for his leadership in the apicultural community. "It was a big honor to be selected to receive the Roger Morse Award this year," said Zawislak. The award annually recognizes an accomplished individual in teaching, extension or regulatory activity in the field of apiculture, more widely known as beekeeping. The award also includes a $500 gift. "This award is named in honor of Dr. Roger Morse, who was an entomologist and honey bee specialist at Cornell University, who had a big impact on the beekeeping industry by helping to bring solid science into the practice of bee colony management," said Zawislak. In fact, Zawislak's first mentor in beekeeping was Donald Steinkraus, an entomology professor in Bumpers College, who actually studied under Morse. The Eastern Apicultural Society held its annual conference at Hampton, Virginia, last month, attracting 400 to 500 hobbyists and commercial beekeepers as well as scientists and researchers from across the globe. Zawislak, who has worked with honey bees since 1998, has spoken at many of the society's meetings since he first attended in 2009. Since receiving his own master beekeeper certification, he has also helped with the society's instruction and testing as well as teaching courses in his home state. "Since I started as the apiculture specialist here, nearly 10 years ago, I have had the opportunity to teach a lot of workshops and short courses all over the state, to share my knowledge and love of the honey bee," said Zawislak. His courses are offered through the Cooperative Extension Service. "I really enjoy working for Cooperative Extension because I truly believe in its mission to bring solid, practical, science-based information and solutions to the farmers, homeowners and beekeepers who need it." For his Ph.D. research, Zawislak works under the direction of assistant professor Neel Joshi in the Department of Entomology. His dissertation research focuses on the effect of neonicotinoid insecticide exposure on honey bees. He is investigating risk factors associated with honey bees foraging in agricultural landscapes, and quantifying pesticide effects on honey bee health. "Jon enthusiastically participates in honey bee applied research and extension activities," said Joshi. "Over the past few years, he has developed a strong statewide apiculture program in Arkansas, and this recognition is well deserved. 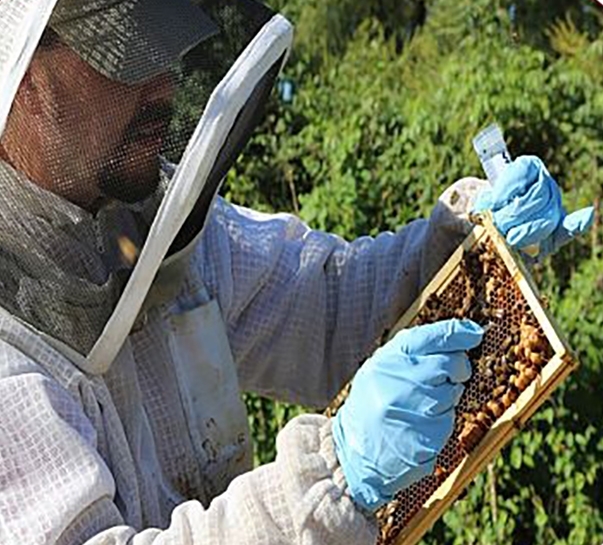 He offers a short course on beekeeping, which is very popular among beekeepers in this region."